Riders Choice offers indoor heated motorcycle storage all year round, with special packages during the winter months. You can sleep well knowing your motorcycle is safe, Winterized, and will be ready to go for you in the spring time! The Winterization process involves giving your ride fresh oil, to reduce the number of contaminants sitting in the engine block while being stored. Your tire pressures are raised to avoid deformities, battery removed and maintained, fuel stabilizer added to your gas tank, and key areas are lubed to keep all your parts moving smoothly! 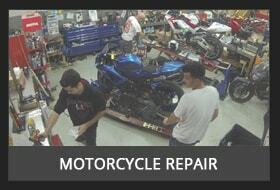 Our technicians will also perform a 24-Pt Inspection to give you a health report on your motorcycle, we will let you know exactly what it needs to be in top shape for next spring, and you will also receive discounted labor costs as an added bonus of storing your motorcycle with us this winter! Drop your ride off at Riders Choice this winter and we will keep your precious motorcycle safe and sound. Please call 905-896-7433 for details on motorcycle storage.